Leavitt Family History | John Quincy Leavitt. This web page is the Leavitt family history of John Quincy Leavitt, who was a Mormon pioneer and our first ancestor to enter the Salt Lake Valley on a wagon train in September of 1860. John Quincy Leavitt is a 7th Generation descendent of Deacon John Leavitt, who was the first Leavitt to arrive in North America in 1628. This is the genealogy of the Leavitt family. The focus of this web site is the family history beginning with John Quincy Leavitt, however through the ancestor buttons, you can go back to our early ancestors in England. John Quincy Leavitt is my ancestor. He is my great grand father. My name is John Michael Leavitt. I go by Mike. John Quincy Leavitt was born on October 1, 1833 in Compton, Quebec, Canada. Compton is right on the border of Canada and New Hampshire. John Q was the sixth child and third son of John and Lucy Rowell Leavitt. In 1845 the John Leavitt family moved to Michigan at Cambria, where the family was converted to the Mormon Church. During this time in his biography it states that John Quincy wanted to complete his education at Michigan College. This is where he met Melinda Minion, daughter of Isaac and Clarissa Minion, who also graduated from Michigan College. In researching this fact I was unable to located Michigan College or any college or university near Cambria that John Quincy attended. Melinda and John Q were married in the old Minion homestead in Michigan. John’s older brothers and sisters were also married, and they all wanted to go west together. They were delayed, however, due to the death of their father John February 17, 1852, whose passing and burial at their farm made it necessary to change some of their immediate plans. Lucy Rowell Leavitt and her family left Cambria, MI heading west in 1854. It appears that Lucy left Cambria with the following children: Josiah Leavitt and his wife Charlotte Love Leavitt, John Quincy Leavitt and his wife Melinda Minion Leavitt, Lucinda Leavitt and her husband Benjamin Franklin Brown, Orilla Leavitt and her husband Philander Brown and her daughter Sarah Leavitt. The family traveled to Oak Lawn in Illinois where Lucy’s sister in law Rebecca and her husband Franklin Chamberlain lived. It appears they left Oak Lawn in 1858 and Lucy Rowel Leavitt died on the trail near the Platte River in Iowa on the 23 of July 1858. Sara Leavitt either returned to Oak Lawn after her mother’s death to marry James Chamberlain or did not leave Oak Lawn. She did not go with the family to Utah. In 1860 at Florence, Nebraska the remaining Leavitt Family started their way west with the Franklin Brown Company. Charles Savage the famous Western Photographer was also on this wagon train. At Echo Canyon, Utah Josiah Leavitt, John Quincy Leavitt and the Franklin Brown family split from the rest of the wagon train and following the Weber River into Ogden. They arrived in Ogden in September 1860. 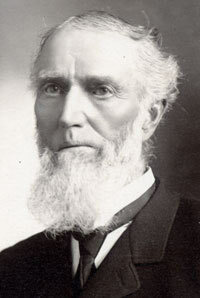 Once settled in Utah John Quincy Leavitt had a variety of jobs and held many offices. He was a school teacher, county clerk, assessor and collector, Justice of the Peace of Davis County, and constable. In the Mormon Church he was the president of the 14th quorum of Seventies and President of the 74th High Priest Quorum, a ward teacher and an active church member. In 1867 he received a military call. He was appointed regimental color bearer in the first regiment of the Davis County Brigade. He was a Lieutenant in the Utah Militia and Vice President of the Utah Livestock Co. It is believed that he also worked on the transcontinental railroad and later Brigham Young assigned him to build a railroad from Ogden to Salt Lake City. This was called the Utah Central Railroad. It is also believed that he was at the Golden Spike Celebration at Promontory Point in 1869. He was known as a pioneer railroad man. He was the first conductor of the railroad and was later appointed the General Director of the Utah Central Railroad. On March 9, 1869 John’s wife Melinda died. Together they had three children, Elmer Brigham Leavitt, John Julian Leavitt and Ida Josephine Leavitt. On August 16, 1869 John Quincy Leavitt married Cynthia Elmer in Ogden. From this marriage there were five more children, two sons, John William Leavitt, and Mark Minion Leavitt and three daughters, Malinda Fadella Leavitt, Mamie Leavitt and Hannah Claire Leavitt. John Quincy Leavitt had two other wives, Elizabeth Jones on September 26, 1870 and Harriet Amelia Folsom Young, who was Brigham Young's 25th wife, on August 15, 1878. These were plural marriages when the Mormon Church was practicing polygamy. John Leavitt was a man of many abilities and interests, but his close family will always remember him for saying that farming comes first if it is done right. He believed there was a proper time for all things to be done. His grandchildren and great grandchildren will do well to always remember him as a man who loved obedience, and his own sons and daughters will tell how he commanded them with a soft low voice, never harsh. John’s sons and daughters anticipated his wants and they were all respectful to their father. His children always went to him for advice, as he was a man of good judgment and sound counsel. His personality commanded respect, not only from his own family, but also from men of prominent positions everywhere. The latter years of his life were spent in Garland, Utah, where he closed his eventful life. John Leavitt was tall, square shouldered with brown eyes, reddish-brown hair and one trait, which he had all his life, was his ready wit. It never left him even in his last illness; many of his words were not sad ones, but often humorous. John Q. Leavitt died September 27, 1913, at Garland, Utah and was buried in the Farmington City Cemetery in Utah.